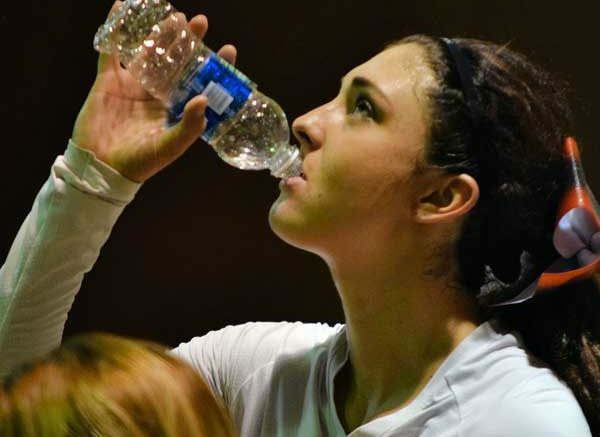 Photo By Raymundo Frasquillo: Willcox senior Mackenzie Welch hydrates before the fifth set in Morenci. The visitors left with a 5-set loss. MORENCI – Morenci (8-7 overall, 1-2 2A East Region, 4-3 seeding, 1.6921 rating for No. 18) hosts Tombstone (6-7, 1-3, 2-3, minus 1.0584 for No. 26) Monday, Sept. 25, for a fourth region volleyball match. The Yellow Jackets have a 3-0 region win over Bisbee on Sept. 19 plus losses of four sets to Willcox (Sept. 12), and three sets to both Thatcher (Sept. 14) and Benson (Sept. 21). Photo By Raymundo Frasquillo: Morenci senior Damiana Rivera helped spark the Wildcats during the fifth set against Miami with a pair of early kills. Morenci won, 3-2, Sept. 19. The Rhyanna Mennen-coached Wildcats went five sets to defeat the Miami Vandals (25-23, 19-25, 20-25, 26-24, 15-9) on Sept. 19 and the Willcox Cowgirls (25-21, 25-20, 22-25, 15-25, 15-9) on Sept. 20, both in Wildcat Memorial Gymnasium, to end week four of competition. Following four final set ties against Willcox, the last at 7-7, a Destiny Apodaca hit gave Morenci the lead for good. A second one made the score 12-7, and a third registered point 15 to close the set and match. The other five points were scored on Willcox errors (9, 11, 14) and Rhiannon Lang blocks (10, 13). Four previous Cowgirls’ errors (1, 2, 4, 5) plus three Morenci kills (3, 6, 7) led to the final tie. For the match, the visitors gave up 70 of 102 points to Morenci on errors. “We’re our own worst enemy,” Willcox head coach Todd DeBaun said. 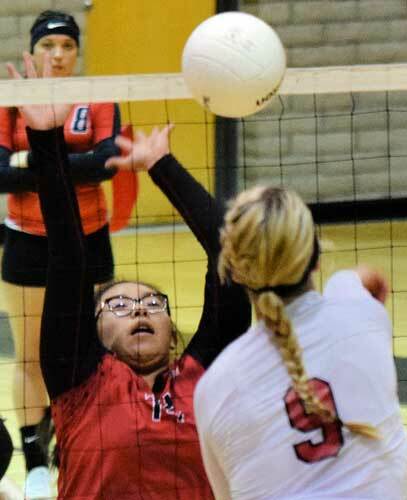 Morenci’s serve percentage was 98 (100-102) compared to 88 (90-12) for Willcox. Individually, the percentages for seniors Janeene Lang (17-0), Tatiana Sandoval (1-0), and Shaunee Seballos (17-0) were each 100, sophomore Angel Ontiveros 100 (16-0), junior Alexis Gregory 100 (15-0), and seniors Destiny Apodaca 98 (21-1), and Audrey Castillo 93 (13-1). 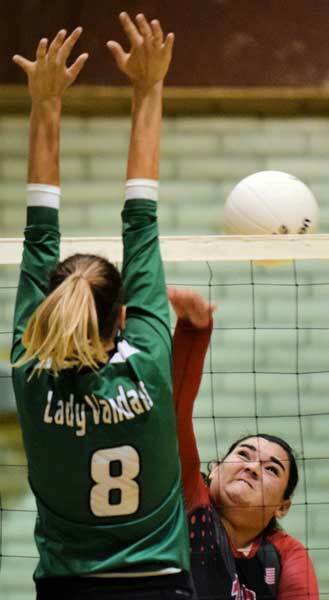 Photo By Raymundo Frasquillo: Morenci junior Rhiannon Lang did not let a missed block discourage her against Willcox. The junior’s block made the score 10-7 in the fifth set. Morenci added five points on two kills and a block plus two Cowgirls errors while Willcox had two more points on Wildcats errors. Morenci won, 3-2, Sept. 20. Deadlocked at two set wins apiece in both matches and 7-7 in set five, the Wildcats posted identical 15-9 fifth set scores to take the matches 3-2. The Willcox pairing was in 2A East region play. A pair of Damiana Rivera hits against Miami, the first tying the score at 3-3 and the next one giving the Wildcats a 4-3 advantage, sparked the Wildcats and gave them a lead they would not relinquish for the remainder of the set.